A few additions to Barnabas' crew! A Bull Snapper. Pretty happy with the result on this one. Had to do a decent amount of greenstuff work to get rid of some of the part edges. Sculpted a wee bit around the eye for the gash. Did a subtle striped pattern for the body, which I plan to do for the rest of my gators as I build them up, as well as the swamp bases for each model. 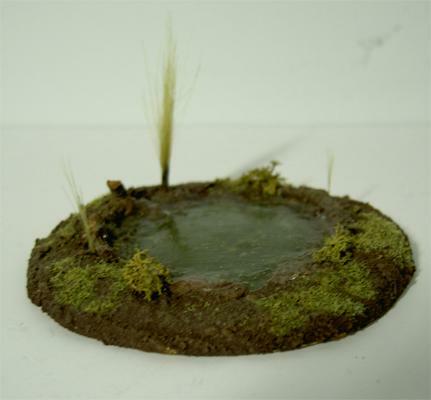 Also created a Swamp Pit Marker for Barnabas' Swamp Pit spell as well as the tier/pact swamp zone bonuses. This one was pretty fun to make, as I don't often do much terrain work. After cleaning up my desk, I found a lid to a Pringles can. Wondered if it could work as a terrain base and turn out it was 3" diameter, which worked out great! 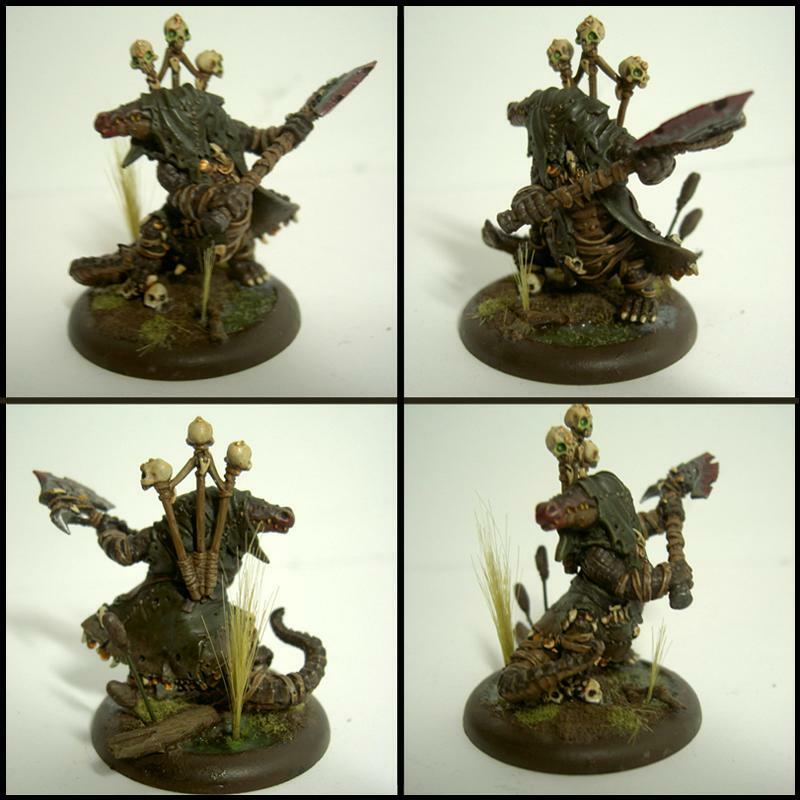 After watching a vid, I went through with it make it with DryDex Spackle, some sand, and some water effects. Tossed some fine grade flock into the water effects to give it a light algae look. The Pringles lid is a bit soft and isnt exactly flat, but it was a good first experiment. Actually nice since it has a slight curve to it where it allows a little bit underneath it and still lays flat. Followed this tutorial series to make it, make a few substitutes for what I had on hand. 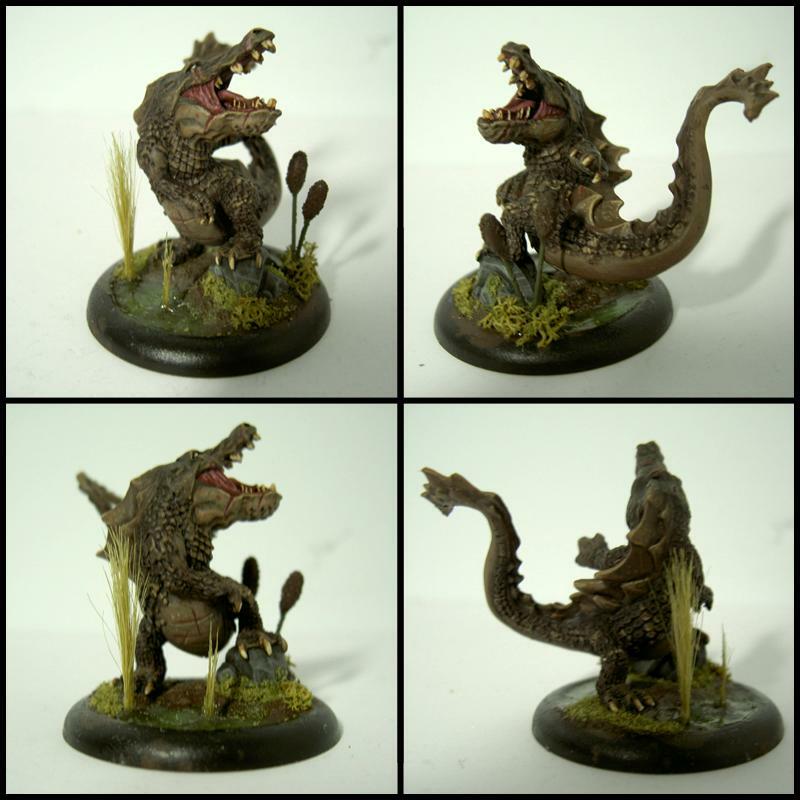 My completed Bloody Barnabas.Very pleased with the swamp basing on this. My first actual detailed, multi-texture base, as I usually stick to plain basalt and gravel. Decided to go with a darker, muted color pallet, painting Barnabas with more of an American Alligator skin. The base was done with a little bit of Spackle (Drydex brand, pink to white dry indication is fantastic), sand from the side of my pool, field grass and a bit of fine green flock. The branches are twigs I pulled from the backyard. Unfortunately I bought Water Effects (a thicker more moldable gel, instead of the regular water stuff, but it worked well enough. A bit of greenstuff on a pin and theres a few cattails. Also building 3" swamp markers, using the same method. It'll be nice to have a good visual when I do Swamp Pit and toss around all the shallow water! Just recently decided to hop into my FLGS's Friday 40k league nights, and am very happy with doing so. Although I'm not entirely content with the current edition, it was enjoyable playing a new opponent for what has seemed like ages (actually probably over 6 years since I've played a pickup game with a stranger). Decided to bring my Salamanders to the table since I'm most comfortable in power armor. No love for the Orks this week, but maybe I'll throw down with them later on. My opponent was a Tau force and we played a short 770pt game. We rolled for the mission and it was a King of the Hill with Night Fight on the first turn. Although the player was new, he was a quick learner and it was nice for me since I had forgotten many rules myself. I managed to nuke myself on my first turn by having my Librarian use Gate of Eternity and scatter a whole squad into difficult terrain, killing 5 of them, 2 of which were special weapons. In the subsequent turn, the rest of the squad was shot to death by Fire Warriors, leaving the Librarian alone. Fortunately enough, his Terminator Armor proved worthwhile and he survived without a scratch. As I marched my other two tactical squads up to the objective, the Librarian assaulted the nearby Fire Warriors squad and tying them up for the remainder of the game. Slight opposition was met when the Tau Commander jumped in, by after a few whiffs with my Force Weapon, I finally killed him, passing my psychic test and killing him outright. The Librarian continued to tie up the fire warriors while the tactical squads controlled the objective. A bit shot up by the ended of the game, which was cut short at turn 5 due to the store closing, but they still got the job done. Definitely looking forward to this weeks games. Eye'd up some of the other players while I waited around, gauging what I may need to take for the future.Overall I'm enjoying the points system. Start off with only Troops and HQ available and as you progress, Elites, Fast Attack and Heavy Support open up, as well as special characters. And a few more games and Vulkan He'Stan will be joining the force. Then I'll be bringing some hurt. Finally done with this sucker. Quite a lot to do on this model and I'm fairly pleased with how it came out. Time to bring this guy onto the field and bring the pain!